Ancient Stones - Lothian - 001 Witches' Stone, Spott Farm, Spott. A Guide to Standing Stones & Stone Circles in the South of Scotland. 001 Witches' Stone, Spott Farm, Spott. 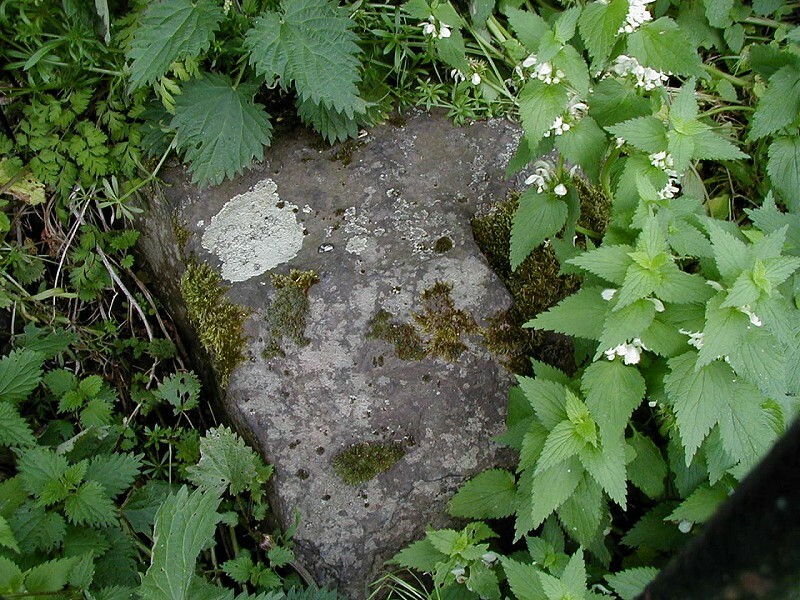 The Witches' Stone is a rather disappointing block of rough stone measuring less than 0.6m each way and lies at the foot of the hawthorn hedge running along the south side of a narrow road. The stone is surrounded by iron railings and was hidden by vegetation on my initial visit. From the A1 south of Dunbar, take the junction for Spott at the roundabout, continue through and parking in the street just before the end of the village. The stone is about 0.5 mile on the left, just before the junction. There is no parking near the site. Cars should be left in Spott village. Spott was notorious for its witches in both the 17th and early 18th centuries and the stone is supposed to be near the spot where Marion Lillie, the Ringwoodie Witch, was burnt to death around 1698. It has been claimed that she was the last witch to be burnt in Scotland, however, three other executions took place in Spott in 1705, one being described as a "burning", the usual fate for those convicted of witchcraft. The location of this is uncertain and may have been Spott Loan, a road leading up hill out of Spott. There are also others elsewhere in Scotland. The Iron Age hill fort on The Chesters, not for to the south west also has associations with witch burnings. One reader sent in a brief note stating that on a family visit to the Witches Stone, coins had been placed in the middle of the stone. The significance of this occurrence is unclear but the timing is not. The day in question was Halloween! Perhaps witchcraft is not forgotten in East Lothian after all? More recently, just after Lammas 2002, a fellow enthusiast reports finding the remains of candle wax and incense on the stone. Playing around with a straight edge and O.S. Explorer Sheet 351, reveals the possible beginnings of a ley line, although further exploration in the field will be required to prove any certainty to this observation. Although it does not comply with the usual criteria for acceptance of a true ley line, the fact that a straight line runs from the standing stone at 006 Broomhouse, through the 001 Witches Stone and strikes the North West edge of "The Chesters" an Iron Age hill fort to the South West, does hint that further investigation might prove fruitful. On the day I visited this stone I had already had a most successful day's stone hunting, having been to see four other standing stones in the area. The fact that I was well thrilled with these earlier finds probably helped to negate the disappointment when I found this one. Its really just a small non-descript boulder by the roadside. Had it not been for the iron railings that protect the stone, you would never know its there. However, it does - allegedly? - mark the spot where the last witch in Scotland was burned. Not worth the effort on it's own but if in the area looking at other standing stones you might as well have a look. Have a look out for anything strange, such as coins on the stones, and get in touch. 005 Standing Stone, Kirklandhill, Tyninghame. 006 Standing Stone, Easter Broomhouse, Spott. Sand Collecting - Everything you might never want to know about sand collecting. Copyright � 2001 - 2008 Gary Buckham. All Rights Reserved.